“I was quite taken aback by the large number of immigrants in the country. Having lived in another country, I know how it is like to feel dislocated … It is very disheartening to be dislocated in your own country.” – former government scholar Winston Lim on his personal political awakening happened in 2009 when he returned home after a three-year working stint overseas. As Abraham Lincoln once said: “You can fool all the people some of the time, and some of the people all the time, but you cannot fool all the people all the time.” The Singapore Government’s latest attempt in using mass media to drum up support for its preceived need to raise the immigration targets “in preparation for the severe aging society by 2050” is flawed with logics. By recruiting more immigrants at their prime 20s-40s, wouldn’t this group of economically active PRs and new citizens be 60-80s in forty years time, adding to our aging woe? As pointed out in this forum letter in Todayonline, it is easy to import immigrants to solve the current problems and push the problems to future generations (kind of remind me of the current financial delimma faced by EU and US). The effect of foreign labour and converting foreigners to Singaporeans are akin to the use of performance-enhancement drugs in sports. It is also ecologically not sustainable and does not take the difficult approach of redesigning works to cater to the change in lifestyle and maturing society (see the fourth article “Look to building up Singaporeans first”). 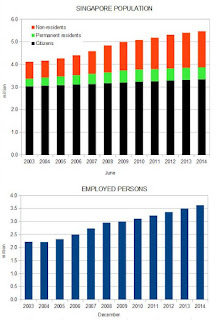 The third article published on the same day clearly articulates one such lazy approach, instead of controlling the car population due to the wrong policy implemented during the 2007-8 financial crisis which resulted in a hugh increase in vehicle population, LTA is proposing to add more lanes (and thereby disturbing the deads and destroying the nature reserve) instead of encouraging car pools and other more innovative incentives such as bike lanes or separate COE for households with more than one cars which by the way are very common to many of the rich people here. On a doomsday day scenario, in a remote event such as a regional war or world wide famine, how long can this island of 5-6 million people (and the Government wants more?) able to survive before help can come? Unlike in other countries with vast land, we have limited trees to eat and river water to drink in times of emergency. I hope our responsible dear leaders have a contingency plan for such a scenario. Never say never. 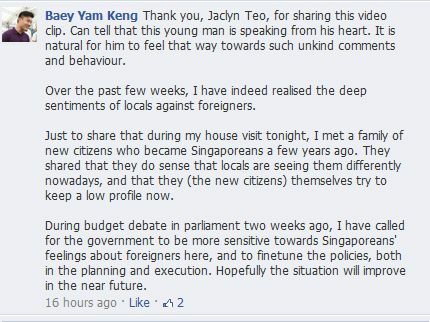 Updated 29 Feb 2012: While apologising for his insensitive comments on the outburst of the “more dogs than humans incident“, MP Baey Yam Keng noted the frustration among Singaporeans on being squeezed out by foreigners, whether it is for seats in the train, or for places in schools. The negative sentiments against foreigners should not all be treated as noise, and he has learnt that he needs to be more sensitive to how people might read into certain words, he said, adding the same applies for policymakers when they craft, implement and communicate policies. Hopefully, our dear politicians can learn some useful lessons out of this episode. Who opened the floodgates to immigrants? ‘Is Singapore my home, daddy? Foreign workers constitute 25% of total population. This is significant. From a high of 79,167 permanent residencies granted in 2008, only 27,521 were granted on 2011. 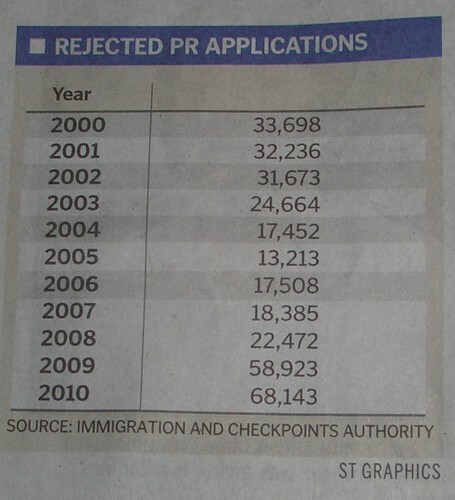 Citizenships granted also decreased from 20,513 in 2008 to 15,777 in 2011. I REFER to the study reported in “Without migration of some magnitude, Singapore’s population will decline, says IPS” (Sept 8). With a low birth rate and longer life expectancy, it is obvious Singapore’s population is ageing. This situation is faced by many developed countries, and it is easy to see that if we can raise the number of young people by migration or by birth, we will have more working people to support the elderly who are living longer due to better medical science. I am not against immigration, as migrants have made positive contributions to Singapore. However, I am concerned that Singapore views it necessary to have ever more young people to look after the elderly. This view is ecologically unsustainable, for the ever more young people will eventually grow old and will need yet more people to support them. This benefits only the present generation at the expense of the next. We cannot increase our population indefinitely. Resources such as food, water and land are finite. Only non-physical things such as respect, spiritual growth, knowledge, health and quality of relationships can increase in a physically finite world. Our census shows that Singapore’s total population has grown from 2.07 million in 1970 to 5.08 million last year. As world population hits 7 billion this year and possibly 9 billion in time, and people in Singapore already complaining of overcrowding and congestion, I hope our leaders will look at ways to manage a stable population and make ageing affordable instead. Longer, healthier lives mean we can work longer. With more flexible job arrangements, more jobs can be done by older workers. Given training and support, the fit old can care for the infirm older. It is unwise to think we can continue adding more people into Singapore and, of course, the world. I REFER to the various scenarios by the Institute of Policy Studies concerning the need to bring in different numbers of immigrants to counter the negative effects of an ageing population (‘Population will shrink without immigrants’; Thursday). The immigrants Singapore would give permanent resident status or citizenship to are likely to be highly educated professionals who are more focused on a career than starting a family, resulting in a low fertility rate. This quick fix of bringing in immigrants may just lead to a problem rearing its ugly head decades down the road, as this group of active working adults will eventually join the ranks of the golden age group, thereby compounding the negative effects of an ageing population. Singapore as a small island nation does not have the land and infrastructure to accommodate tens of thousands of new immigrants yearly and indefinitely. Solving the ageing population issue is a complex one and using economic growth as a benchmark of success and prosperity may not be accurate enough. We may have to think out of the box, using other indicators of happiness and tweaking policies to ensure that each citizen is able to take care of his own needs well, and possibly with some amount of state welfare. I REFER to the article “New dual four-lane road in Bukit Brown to ease heavy traffic” (Sept 13). I am dismayed that more land will be mowed down to accommodate the relentless and unsustainable car population growth in Singapore. Bukit Brown was earmarked as a land bank for future housing development. Unfortunately, an ugly stab will be made into its tranquillity as yet another stretch of land, large enough to provide eight lanes, would be conceded to vehicular traffic. Many cars on the road end up carrying only one occupant and, hence, are not efficiently utilised. Instead, they take up land space and spew tons of heat-trapping greenhouse gases. With the expansion of the rail network, it is time to relook the current disincentives to curb car usage. The measures taken to cope with car numbers in recent decades, such as Electronic Road Pricing, are nowhere successful thus far. More persuasive action is needed to nudge more people to use the rail system, which is touted to be one of the best in the world but has still been found wanting. I hope that when the entire system is operational, the current undesirable conditions would ease. As we have done in many other areas, let us lead the world in caring for our environment, such as by doing away with cars as much as possible and fully utilising the rail network. In a small dot like Singapore, we can do better when we set a common goal. I agree with Mr Ng Ya Ken that “Overcrowding should be the least of our long-term worries” (Oct 14), but there are other consequences to the influx of migrants he would like to see. The key to nation-building policies, in our little red dot with a scarcity of land resources, should firstly be about building up people. When our people are well equipped and given the opportunities, they will feel they belong and be more prepared to take on challenges and be enterprising. I believe that our economy will improve, there will be meaningful ownership and responsibility, young couples will desire for more children, and older Singaporeans will still be able to contribute in the workforce. The poor and the weak will then be well taken care of because people will become more gracious as one nation. But in the past few years, before our young graduated from university or polytechnic, they may have felt discouraged by the influx of migrants and foreign talent. Before older workers reached the retirement age, they may have been perceived as less productive than new migrants and had to accept lower wages despite their years of working experience, knowledge of their fields and understanding of challenges. The middle-aged, who were striving to meet the cost of living for their family, may have been discouraged that there were migrants prepared to accept lower wages for the same job. These aspects are more critical than the support ratio of working-age persons to the elderly. The challenge Mr Ng should focus on is how to build up our people with the right skills to do the right job at the right time (and at the right pay). SLOWER economic growth in Singapore may mean smaller pay rises, and companies in some sectors will shut down and move out of the country. However, the outlook may not be all doom and gloom if a phase of slower growth means the concerns of some lower income groups are addressed by the Government. A shift into the economic slow lane could translate into benefits shared more widely across the country, and a higher quality of life, if the idea of inclusive growth is pursued, said DBS economist Irvin Seah. ‘There have been a lot of unhappy people complaining about housing and public transport, so if the Government addresses these, a slower but more inclusive growth rate may not be a bad thing,’ said Mr Seah. Prime Minister Lee Hsien Loong told Parliament on Thursday that a confluence of factors, including domestic constraints such as land and population, and rising competition may mean a slower pace of growth in the next decade. I AGREE with Prime Minister Lee Hsien Loong that Singapore must remain competitive (‘PM Lee highlights two lessons for Singapore’; yesterday). The disruptive fissures between union and employer reflected in the grounding of planes of Australian airline Qantas over the weekend, and between the Greeks and their government, underscore how vulnerable Singapore can be and how important it is for our companies, unions and Government to continue to work closely together. However, I beg to differ with Mr Lee’s warning that curbing the supply of foreign workers may mean slower growth. While there will be pain, we may not necessarily suffer from lost business opportunities and slower growth. I would urge the Government to look at how we can achieve the same growth with a different approach. I have largely worked in multinational companies (MNCs) and Fortune 500 firms and survived several financial crises. When a crisis struck, we went through a hiring freeze for several years. Yet, my boss at one MNC typically expected us to continue delivering double-digit growth because that is what the shareholders demanded. He would not accept a lack of manpower as a reason we could not grow because of a recession. His blunt message was that he knew there was a recession and a freeze on hiring, but we were paid to figure out how to grow the business in good times and bad, and the bad times were when we were expected to prove our worth. His clincher served an undisguised warning: If we could not do the job and grow the company, he would hire someone else who could. So my MNC continued achieving double-digit growth in all our markets, recession after recession. Singapore has been through hard times before. But we are a unique country with a unique breed of people and we have proven time and again that we can unite and pull together in hard times. The Government must lead the way and show that we can continue to achieve the same rate of growth, notwithstanding the challenges. That is what it is paid for, and what citizens expect. Over the last five years, about 8,800 permanent residents (PRs) served National Service (NS) [Askmelah’s Note: seems kind of low considering the population has grown like more than 1 million over the last 5 year! ], Defence Minister Ng Eng Hen said in a written reply to a parliamentary question. These males had become PRs under their parents’ sponsorship. Of these, about 6,100 have since taken up citizenship, Dr Ng added. In the same period, however, another 4,200 men who were enlisted renounced their PR status before serving NS. They too had become PRs under the sponsorship of their parents. Dr Ng said their failure to serve NS would be taken into account when they subsequently apply to study or work in Singapore. They were warned about the consequences of their decision before they renounced their PR status, he added. THE report “Foreign labour cuts: Too deep?” (Feb 29) showed how supportive Members of Parliament were of our many small and medium enterprises on this issue. But while our SMEs are started mostly by local entrepreneurs, it would be pointless if they are allowed to hire more foreign workers solely to make profits, without really benefitting local workers in the process. Our service and manufacturing SMEs have cried out that local workers have shunned these industries. But did SMEs try their best to attract workers by providing competitive salary packages before requesting for more foreign workers? SMEs should not expect Singaporeans to work in exploitative conditions as foreign workers do in clocking 12 to 14 hours daily. They should have decent work hours for local workers. As Singapore is a small country, we cannot afford to keep bringing in more foreign workers. Perhaps, SME bosses who drive big cars and live in condominiums have not experienced the peak-hour squeeze that many Singaporeans have in their daily commute. Our infrastructure is being stretched to the limit. The Government has been pro-business all along, enriching many SMEs, but if bringing in more semi-skilled foreign workers would adversely impact Singapore’s social dynamics, it should be commended for slowly cutting off the supply tap, so that SMEs would either improve productivity or hire locals. There is now no better choice. The ability of Singapore to absorb immigrants as new citizens at current rates should not be considered in isolation. The issue must be viewed within the context of the influx of foreign workers and foreign students as well because they complement the economic value of new residents. I we agree that this is so, there must be a system of trade-offs between these groups and not an unconditional acceptance of immigrants and foreigners. Singapore is small geographically and densely populated. The annual addition of new immigrants is not an issue. However, the economic and social spaces are shared not just with more new residents but also more foreign students and foreign workers. There are now about 1.3 million non- residents (foreigners living, studying and working here) sharing space with 3.2 million citizens and 541,000 permanent residents. Singaporeans are rational and understand the necessity for immigration and attracting global talent. The question is whether the infrastructural support is adequate for the total number of foreigners, including non-residents. An ageing population is a concern, but the Government appears to have reacted by putting the cart before the horse. Furthermore, many new residents do not have more than two children, and this is likely to exacerbate the ageing problem in the long term. Whether these new residents can afford their retirement is moot as they will still consume limited resources such as transport and health care. I REFER to Ms Mona Chew’s letter “Wage reform will allow for a chance to transform Singapore” (April 18). The issue goes deeper than just wages. Her description of two worlds in Singapore is by and large a result of a national strategy, starting in the 1990s, that had put gross domestic product (GDP) growth above almost all else. The strategy accelerated over the next decade, in the belief that GDP growth had no serious downside, and if there was, it would be healed by the growth itself. In that climate, business interests started to drown out societal concerns. Businesses brought in more low-skilled foreigners, who became an alternative to investment in productive machinery and upgrading jobs. In some instances, such as the replacement of automated car wash machines with foreign labour, productivity gains were reversed. Instead of redesigning jobs and changing habits to increase productivity at food courts, businesses used cheap labour to clear and clean tables. Such labour not only drove productivity down but also taxed our limited spaces and facilities such as transport and healthcare. To relieve pressure on our facilities, more foreign labour was needed. They, in turn, had basic needs that required even more foreign labour to meet. So, seemingly innocuous business clamour for cheap labour had created an unnecessary dependence on foreign labour and triggered a multiplier for them. Singapore needs to restructure this part of the economy, to break its reliance on cheap foreign labour, by investing in machines, redesigning jobs, driving up productivity and educating locals that more is at stake than indulgence in small, frivolous services. Many jobs for foreign labour would be lost, but better-paid jobs would be created for locals, and the two worlds described by Ms Chew would draw closer. This restructuring requires political leadership to look beyond the legitimate self-interest of businesses and to treat GDP growth as it is, a rough measurement of increased economic activity. How we choose to grow it and at what speed are more important than the result itself. What is the use of fast GDP growth when it is attained by bringing in a whole spectrum of foreigners and results in social discord? In fact, Ms Chew may have missed another world in Singapore, the foreigner world. The report “Immigration will help but …” (May 4) underscores the importance of not viewing immigration as a panacea to Singapore’s ageing population. As the study by the Institute of Policy Studies suggests, all that replacement migration does is to delay population decline and ageing. Singapore’s non-citizen population has already been growing rapidly, from 14 per cent of the total population in 1990 to 37 per cent last year. Further increases in the share of the foreign-born population may not only be politically difficult but may also bring about far-reaching social, economic and environmental consequences for Singapore. Instead of trying to mitigate population ageing with short-term measures such as immigration, a longer-term perspective could be adopted. Policymakers could consider more feasible options such as adjusting the retirement age, encouraging greater labour force participation or redesigning the Central Provident Fund in a way that better supports the elderly in their retirement. The report mentioned that the IPS study and the National Population and Talent Division’s recent paper will form the basis for a government White Paper on population goals and policies. Caution should be exercised when using these studies as a backbone for policy formulation. Demographic scholars such as Frederick Meyerson and Harold Dorn have noted that population projections are unreliable, particularly long-term ones such as those by the IPS and NPTD, which extend to 2050. I REFER to the report “Immigration will help but …” (May 4), a hot topic in recent months. The tension lies in meeting our economy’s needs based on current birth rates, while preventing an influx of foreigners from overcrowding Singapore and applying excessive pressure on local workers. First, let us be thankful that many people, especially from the region, want to live and work here. As former British Prime Minister Tony Blair said before, it is always a good sign when more people want to enter your country than those who want to leave it. Second, the need for more migrants is often premised on birth rates remaining low. Not only is this flawed, it fails to recognise that size of the migrant population can affect Singaporeans’ birth rates. Simply put, Singapore is crowded. High costs, intense competitiveness and a high-stress environment, at work and in school, make it more challenging to have children and raise a happy or larger family. If the foreign worker population continues to grow sharply, it would further strain our infrastructure and increase the threats locals face in obtaining and keeping their jobs. This can only be expected to reduce our birth rate further, which would harm Singapore in the long run, even if it helps to deal with the problem of an ageing labour force in the short term. We would be shooting ourselves in the foot. Furthermore, as long as low-productivity, low-wage foreign workers remain abundant here, Singaporean workers would be forced to also remain at lower productivity and wage levels despite our relatively high education levels. On the other hand, if the proportion of migrant workers were to remain constant or even decrease over time, competitive and cost pressures within our domestic economy would ease. More families would be able to freely choose whether both parents should work, instead of feeling constrained to maintain two income streams. With our well-educated population, I am sure productivity levels would increase. To ensure Singapore is a pleasant place for families to live, the number of migrant workers needs to be managed carefully by keeping our infrastructure limits in mind. Birth rates could then increase. CHILD bearing is expensive today (‘6 months’ paid leave for mum?’, Sunday; and ‘Bosses’ group against NTUC’s ideas for boosting birth rate’, Wednesday). Raising two or three children until they obtain university degrees could cost up to $1 million or more. Deciding to have children may well be the biggest financial commitment in a couple’s life. Yet, while the decision by couples whether to have children is personal, the collective consequences of their decision will make or break the prospects of a nation’s survival. Population decline is a serious national issue, and is a crisis once a nation’s total fertility rate plunges to 1.2 and below. At such a low fertility rate, a fertile female population of 1.6 million will be halved in 30 years, and reduced further to a quarter, or 400,000, in another 30 years. Even if the country accepts enough foreigners to compensate for the baby shortage, in six decades’ time, only one in four new babies born then will be from the original stock of native-born citizens. The majority will be the offspring of new immigrants. Can a tiny, young nation like Singapore withstand such a swift and drastic demographic transition? Our current generation may not have to bear the social and political consequences of such a game changer, but our children and grandchildren will. The biggest mindset change we need is to treat our population issue as a national crisis. Once the potential consequences of the baby shortage are raised to crisis levels, the nation will be focused on the problem; the current reactive mode will switch to one that is proactive. Couples cannot merely wait for more incentives before deciding to have more babies. To deal with a crisis, old rules may have to make way for new ones, one of which is to treat young mothers as being as important as national servicemen, and to ensure their interests are protected and taken care of. Raising the birth rate issue to crisis levels will help the relevant stakeholders accept, for instance, that if productivity and company profits must be sacrificed, so be it. Without this crisis mindset, Singapore’s fertility rate will have no other direction to go but down. Askmelah’s Note: I don’t think most Singaporeans are anti-foreigners per se. Most are just put off by some bad encounters with some foreign trashes that posed as talents, in particular those that come from China and Philippines. Instead of being grateful to Singapore who provide them with a good life, free scholarship and almost guaranteed tickets to the pink IC, many of these so-called talents think that they earn it for keep and bite the hands that feed. It is many of such incidents that many Singaporeans encountered on a daily basis that the resentment has been building up over the years, esp the last few years where a open floodgate of PRC people flooding the Republic competing in lowly paid jobs from coffee assistants all the way to university professors. God bless Singapore! 1 Pings/Trackbacks for "Singapore population can’t keep rising – The flawed liberal immigration policy of Singapore"